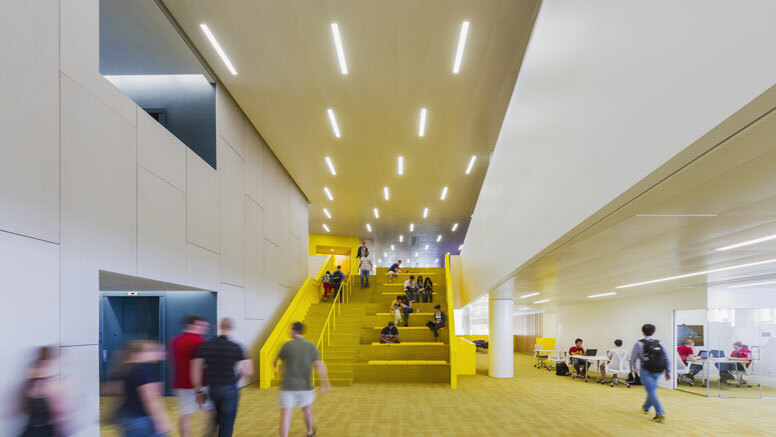 Snøhetta worked closely with NCSU Libraries to set a new benchmark for technologically-sophisticated collaborative learning spaces. 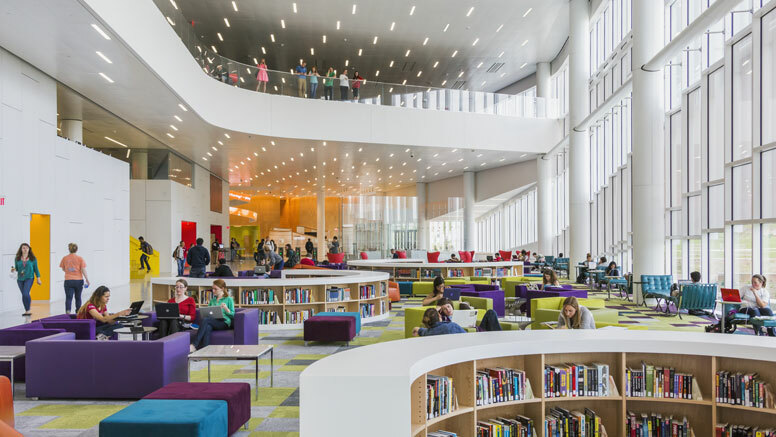 Libraries have evolved dramatically in recent years, moving away from introverted spaces lined with shelves, to more vibrant social and collaborative spaces, with allocated spaces for reflection. 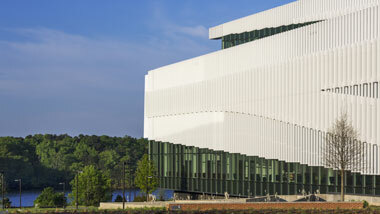 The Hunt Library at North Carolina State University serves as a comfortable living room for students as well as their intellectual base-camp on the campus. A contemporary structure within a traditional context, the Hunt Library provides a forward-thinking platform for influencing its surroundings. Both technical and programmatic innovations are celebrated as part of the learning experience and provide a versatile and stimulating environment for the user. 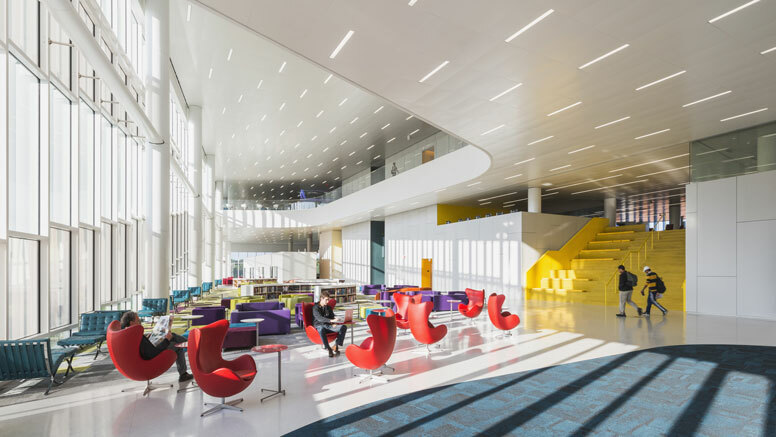 Generous open spaces connect all floors of the library and open stairs emphasize an interactive and social environment alongside more focused study areas. 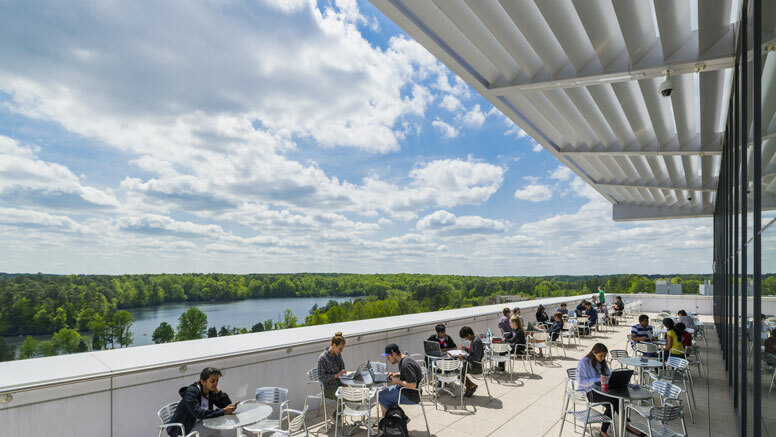 A wide variety of study and learning environments and technology-focused experimental labs go beyond the now ubiquitous model of the learning commons. 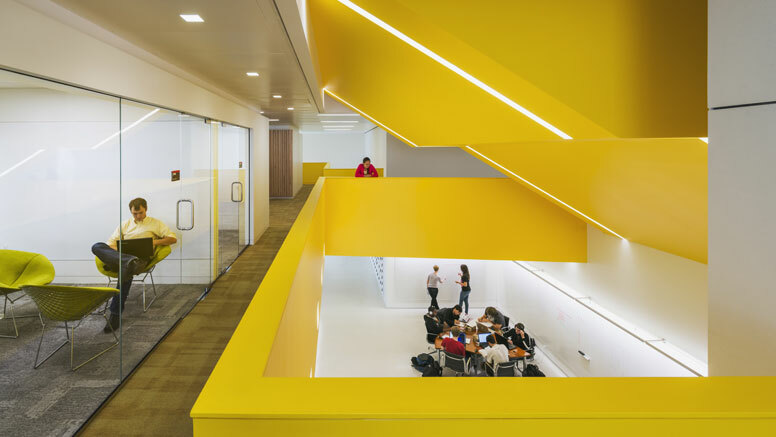 “Disruptive” learning spaces with colourful, dynamic furnishings exist adjacent to more traditional study rooms. 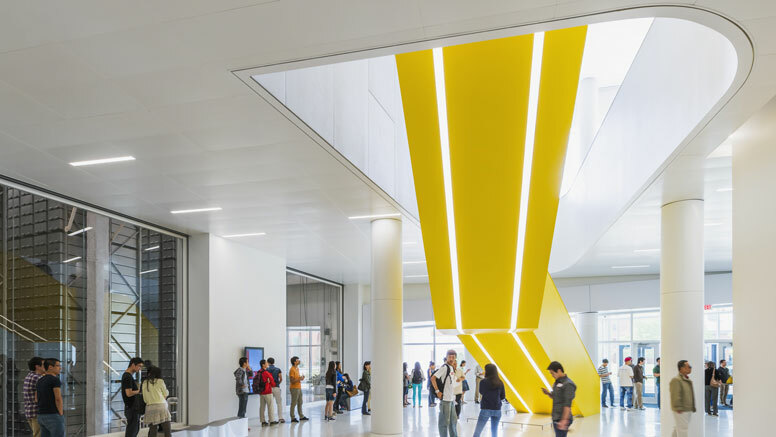 The building’s design recognizes the power of chance encounters and celebrates the role physical space plays in the intellectual stimulation of its users. Technology zones are integrated throughout the Library. 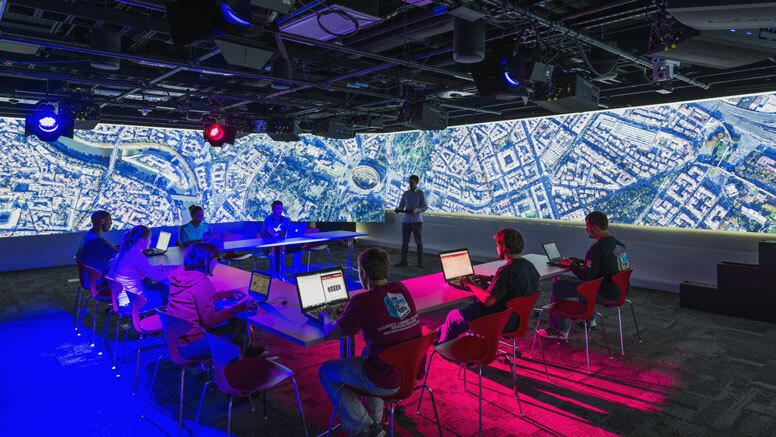 Interactive digital surfaces and HD video display screens deliver both programmed and live-feed information. The Game Lab serves as a testing lab for video game design. 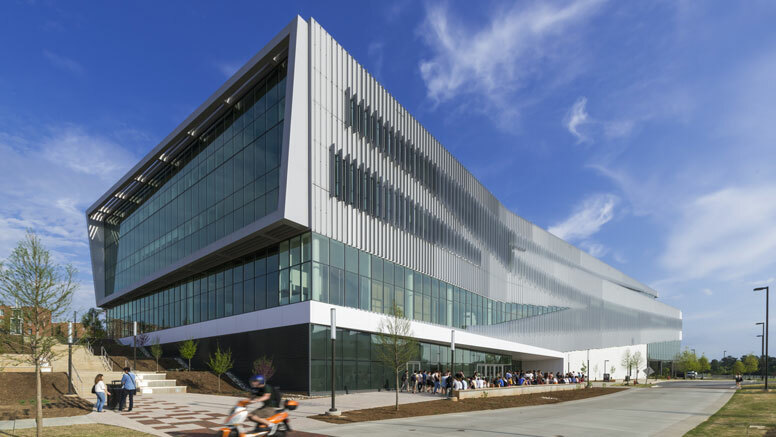 The Hunt Library employs numerous sustainable measures and creatively integrated technologies to achieve a LEED Silver rating. Solar panels located on the roof and the roof itself, built with a high albedo, minimize the heat island effect of the building. Self-regulated light fixtures are used in the interiors and ample daylighting also reduces the artificial light load. Rain gardens in the landscape masterplan reduce storm water runoff, and a cistern collects rainwater for site irrigation. 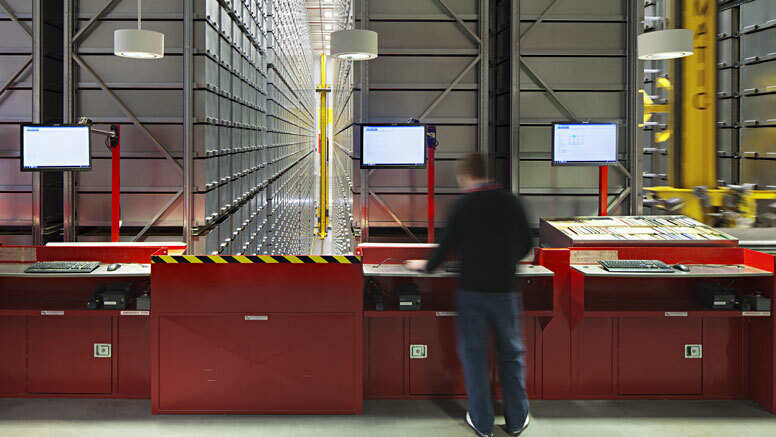 The use of the automated book storage system also reduced the overall size of the building by nearly half. Chilled beams and radiant panels in the ceilings dramatically reduced the size and capacity required for the mechanical room. 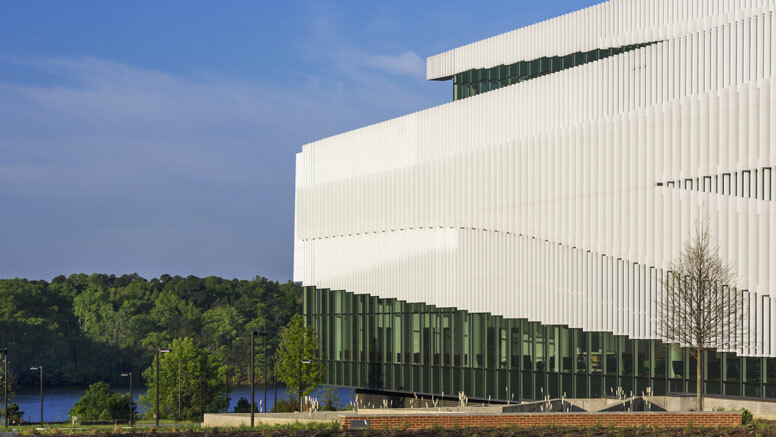 At the time of construction, North Carolina’s state energy requirements were stricter than LEED requirements, allowing only 40% of the entire building envelope to be glass. A file of plans and elevations.